Caro Marco, Gostaríamos de agradecer o dia maravilhoso que nos proporcionou! O tratamento amigo e ao mesmo tempo profissional nos deixou à vontade desde o início. O passeio pelas colinas de Florença nos proporcionou o prazer e o desafio de pedalar em trilhas e estradas muito agradáveis. Conhecemos bonitas paisagens dos arredores de Florença, fizemos um ótimo almoço com vinho suficiente para nos "estimular" nas próximas subidas. Este passeio será sempre lembrado com muita alegria!!! Dear Marco, We would like to thank you for the wonderful day with you! Your very friendly and professional treatment made ​​us comfortable from the start. The ride through the beautiful trails and roads in the hills offered lots of pleasure and challenge. 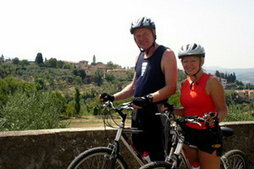 We had great views of Florence, a tastefull lunch with enough wine to "stimulate" us into the next uphills. It couldn't be better. This tour will always be remembered with joy! 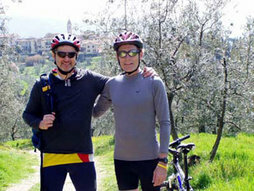 Marco, I wanted to send a quick note to thank you for the wonderful personal bike tour you did with me and my husband, Scott. Wow, it seems like yesterday when I think of some of those hills! The ride to the top was definitely worth it. Thanks also for your recommendation to your friends restaurant. We went the next 2 nights for our evening meal and thoroughly enjoyed it - real home cooking! Also, we did the trip out to the coast as you suggested and it was incredible. Again, thank you for a fantastic experience! Thanks again for a great day biking. 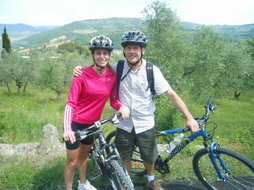 We all had fun, and Molly is even considering mountain biking with Tom, now that she knows she can climb hills! It's motivated Sam to get some more time on the bike as well. You made us all feel safe and have a unique day in the Tuscan hills.